Halifax, NS, 29 January 2016 – DHX Media (“DHX” or the “Company”) (NASDAQ: DHXM; TSX: DHX.A, DHX.B), a global leader in kids and family entertainment content, announces the rebranding of its content-creation arm to DHX Studios – dedicated to developing and producing the highest quality, original content in both animation and live action for kids and families. DHX is also building a brand new 60,000 square-foot, state-of-the-art animation studio in Vancouver, to consolidate its West Coast production operations of approximately 700 personnel. The new facility is slated for completion in December 2016. DHX Studios unites development, production and interactive under a veteran management team, led by Asaph Fipke as Chief Content Officer, and Ken Faier in the role of Senior Vice President and General Manager. In addition, Kirsten Newlands is Senior Vice President, Animation Production; Stephanie Betts is Vice President, Development and Current Series; Logan McPherson is Vice President, Creative – Animation Production; Phillip Stamp is Vice President, Current Production, Halifax; Tracey Jardine is Vice President, Live Action. LA-based Josh Fisher recently joined the company as Vice President, Creative Affairs, reporting to Stephanie Betts. DHX Studios will report to DHX Media’s President and Chief Operating Officer, Steven DeNure, and will drive the development and production of original animated and live action content for the Company’s world renowned library, and continue to partner with key content creators around the globe. Recent original DHX productions include Inspector Gadget, Slugterra, Dr. Dimensionpants, Super Noobs, Teletubbies, Make It Pop, and Degrassi: Next Class. Other series recently announced and currently in either production or development by DHX Studios include Airmageddon, Cloudy with a Chance of Meatballs, and Stephen & Lucy Hawking’s Secret Key to the Universe. DHX Media Ltd. (www.dhxmedia.com) is a key player internationally in the production, distribution, broadcast and licensing of entertainment content for children and families. Owner of the world’s largest independent library of kids’ and family content, at more than 11,000 half-hours, DHX Media is recognized globally for such brands as Teletubbies, Yo Gabba Gabba!, Caillou, In the Night Garden, Inspector Gadget, Make It Pop, Slugterra and the multiple award-winning Degrassi franchise. DHX Media is comprised of four main business units: DHX Studios creates high-quality original entertainment at its Vancouver and Halifax animation studios, its Toronto live-action studio, and in working with top international producers; DHX Distribution is a major provider of content to the global market; DHX Television, home to the Family suite of channels, is dedicated to delivering best-in-class programming to Canadian families; and DHX Brands specializes in creating, building and managing high-profile global entertainment brands within the children’s and young-adult markets. DHX Media also owns the full-service international licensing agency, Copyright Promotions Licensing Group Ltd. (CPLG), which represents numerous entertainment, sport and design brands. DHX Media has offices in 15 cities worldwide, including Toronto, Vancouver, Halifax, Los Angeles, London, Paris, Barcelona, Milan, Munich, Amsterdam and Beijing. The Company is listed on the NASDAQ Global Select Market under the ticker symbol DHXM, and on the Toronto Stock Exchange under the ticker symbols DHX.A and DHX.B. This press release contains forward looking statements with respect to DHX including the completion of production of multiple series, the business strategies of DHX, and the future operating activities and performance of DHX. Although the Company believes that the expectations reflected in such forward looking statements are reasonable, such statements involve risks and uncertainties and are based on information currently available to the Company. Actual results may differ materially from those expressed or implied by such forward-looking statements. Factors that could cause actual results or events to differ materially from current expectations, among other things, include risk factors discussed in materials filed with applicable securities regulatory authorities from time to time including matters discussed under “Risk Factors” in the Company’s most recent Annual Information Form and annual Management Discussion and Analysis, which form part of the Company’s registration statement on Form 40-F filed with the United States Securities and Exchange Commission. These forward-looking statements are made as of the date hereof, and the Company assumes no obligation to update or revise them to reflect new events or circumstances, except as required by law. By Mike September 25, 2015 September 25, 2015 Press Release, Promote Yourself! Munich, September 25, 2015 – Studio 100 Media announced today that Sprout, NBCUniversal’s preschool TV network, has acquired the rights for both the new CGI series and 3D feature of worldwide popular brand MAYA THE BEE. Maya the Bee (78 x 12 min) tells the story of Maya, a young bee who left her hive to discover the beauty and mysteries of nature. As she explores the meadow where she lives, she meets other creatures, goes on adventures, and shares her joy with her friends. The series will premiere on Sprout on Saturday, September 26th, with brand new episodes airing Saturdays at 9:00am ET. Maya the Bee will also air Sunday–Friday at 9:00am ET. The movie will air on September 26th at 5:00pm and 9:00pm ET. 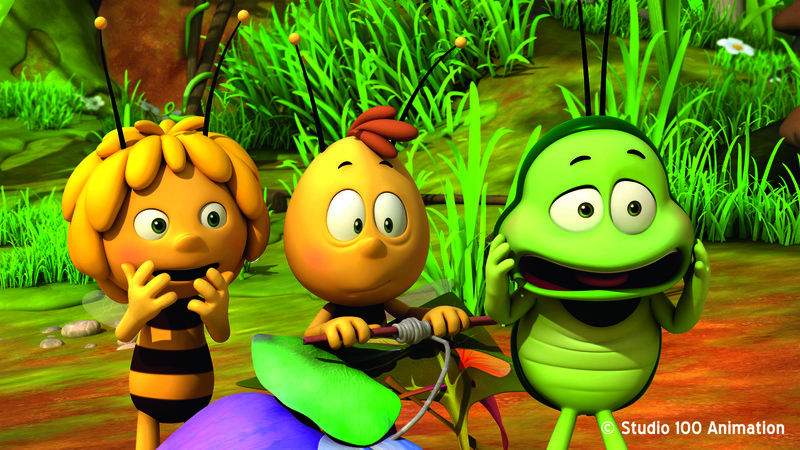 Studio 100 Media’s CGI series Maya the Bee is a French-German co-production of Studio 100 Animation with TF1 and ZDF. Studio 100 Film presents the Maya the Bee – Movie as an German-Australian co-production of Studio 100 Media and Buzz Studios in association with Flying Bark Productions. Studio 100 Media is a subsidiary of the Belgian Studio 100 NV. The Munich-based company is an international production and distribution company for quality and non-violent children’s entertainment. It has a private, diversified library and develops and acquires new formats. It is also responsible for the global sales of its own rights portfolio as well as for third-party distribution of programmes and exploits its motion picture portfolio in the digital arena. The Studio 100 Group uses the new technical possibilities on offer to produce new productions of TV series, which have also been adapted to suit the viewing habits of children today. Since 2012, Studio 100 Media has been a producer of animated children’s films and so continues to foster their brands beyond their mere presence on TV. With the founding of Studio 100 Film, a subsidiary of Studio 100 Media, the company has expanded its business areas to include to the worldwide distribution of feature films. Recently, the company has begun to present selected brands in the form of stage shows. The well-known brands under the umbrella of Studio 100 Media include “Maya the Bee”, “Heidi”, “Vic the Viking” and many Astrid Lindgren series, including “Pippi Longstocking”. Studio 100 Film is a worldwide sales company of motion pictures within the family entertainment sector. Based in Munich, Germany, the company is a hundred percent subsidiary of the international distribution and production company Studio 100 Media GmbH. It is the objective of Studio 100 Film to offer top-class, non-violent and above all family entertainment around the globe. In so doing, the company works on the basis of long-term partnerships, as well as project-based co-operations. Sprout is the first 24-hour preschool destination available on TV, on demand and online for children ages 2-6 and their parents and caregivers. Available in over 58 million homes, Sprout features original programming, including Ruff Ruff, Tweet and Dave and Astroblast!, a library of series, including Caillou and Sesame Street, and U.S. exclusives including Lazytown and Tree Fu Tom. Sprout’s Sunny Side Up Show is the only daily morning show for preschoolers and broadcasts live from NBCU Studios in Rockefeller Plaza. Sprout’s VOD offering is the #1 on demand service for younger children with over 1.8 billion views. Sprout was fully acquired by NBCUniversal Cable Entertainment in November 2013. Please visit sproutonline.com for additional information. By Mike June 5, 2015 June 5, 2015 Press Release, Promote Yourself! Los Angeles, CA – This summer, join your favorite storybook characters in a hilarious mash-up of the most celebrated fairy tales when the highly anticipated feature-length movie THE SEVENTH DWARF opens theatrically in New York and Los Angeles on July 31, 2015 from Shout! Factory Films. This new CG-animated feature boasts an exceptional voice cast of Peyton List (Disney Channel series Jessie, Diary of a Wimpy Kid), Norm MacDonald (The Middle, Saturday Night Live), internationally renowned singer and actress Nina Hagen and newcomer Joshua Graham. Directed by Harald Siepermann (Tarzan, Enchanted) and Boris Aljinovic, THE SEVENTH DWARF is a wonderfully magical movie adventure packed with fantastical characters, non-stop laughs and toe-tapping songs that the whole family will enjoy! Written by Harald Siepermann, Daniel & Douglas Welbat, based on the characters by Otto Waalkes and Bernd Eilert, THE SEVENTH DWARF is produced by 7 Dwarves Animation Company in co-production with Cinemendo, Erfttal Film- & Fernsehproduktion, CC Medienproduktion, TransWaal Film, VIP Medienfonds 2 / VIP Medienfonds 4B, Rialto Film, MCC Independent, Universal Pictures Productions. THE SEVENTH DWARF opens in New York and Los Angeles on July 31, 2015. The film is rated PG and has a run time of 88 minutes. For more information about THE SEVENTH DWARF, please visit www.SeventhDwarfMovie.com . (June 5, 2015 – Toronto, Canada) – International distributor Portfolio Entertainment has signed multiple deals for three animated series from its kids catalogue with broadcasters in Canada, Norway and UAE. The animated hit series DOKI (26 x 30’) has been sold to NRK in Norwayand TVO and Knowledge Network in Canada. The series centres around curious Doki, as he and his five friends travel the world, exploring distant lands and cultures while answering important preschool questions. The UAE’s E-Junior has acquired season two of the celebrated preschool series The Cat in the Hat Knows A Lot About That! (20 x 30’). Inspired by Dr. Seuss’ beloved Cat in the Hat, the series follows best friends Sally and Nick on magical journeys into the natural world. With the Cat as their guide and Thing One, Thing Two and their Fish along for the ride, every outing becomes an unpredictable adventure. Additionally, RoboRoach(52 x 30’), a high-concept animated series about cockroach Reg and his half-robot, half-cockroach brother Rube has been purchased by BBC Kids in Canada. Bristol, UK / Toronto, Canada – April 2015: Wildseed Studios and Tricon Kids & Family announce they are co-producing a new animated TV comedy series Counterfeit Cat (26×30′, 52×11′, plus 11 x 2′ shorts), targeted to 6-12 year-olds for Disney XD EMEA and Teletoon Canada. The UK-Canada co-production is starting production at Wildseed’s newly launched Bristol studio which will also handle the shorts and pre-production. Tricon International will handle global distribution across all platforms. Counterfeit Cat stars Marc Wootton, the English character comedian who provides the voice for Counterfeit Cat “Max”, and Kayvan Novak, the British–Iranian actor and comedian best known for co-creating and starring in the comedy series Fonejacker, who provides the voice for “Betty”. Counterfeit Cat is the story of Gark, a naive 9 year old alien with uncontrollable superpowers and destined to save the universe and Max, an anxious but vain housecat who’d prefer to save himself. Sent for training off-world, Gark mistakes Max for a tiger who can teach him to be a hero so he can fulfil the ancient prophecy and save the universe. The problem is Max doesn’t know much about being brave: he knows about watching TV, knitting and coughing up fur balls. But Gark’s adventurous instincts force Max, albeit reluctantly, to act like the tiger Gark believes him to be. “Tricon is thrilled to be in partnership with Wildseed Studios on our first original animated co-production for Disney EMEA and Teletoon. The creative team that has been assembled is top notch. Counterfeit Cat is an outrageously funny and witty character driven comedy that is sure to appeal to global audiences of all ages, for many years to come,” said Frank Saperstein, Executive Vice President, Tricon Kids Family & Animation. Founded in 2013 by Miles Bullough & Jesse Cleverly, Wildseed Studios is a new type of Entertainment Company based in the UK whose mission it is to help bring creative projects to life through nurturing, developing and financing talent. Wildseed Studios is dedicated to providing audiences with fresh, original content from the next-generation of creators. Tricon Kids & Family is a boutique division of Tricon Films & Television, one of North America’s strongest independent production and distribution companies dedicated to producing and representing ground breaking television. Tricon Kids & Family features both original production and acquired third party content. Following the success of the multi-season, award winning format The Next Star, Tricon Kids & Family specializes in developing strategic partnerships in all genres including animation, live-action scripted and reality.